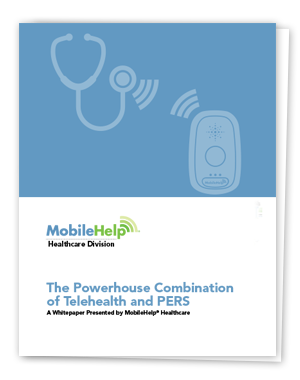 Geared toward healthcare providers and caregivers, this white paper focuses on attaining improved patient outcomes through the use of MobileHelp® MobileVitals® solution, which combines both telehealth and a personal emergency response system (PERS). It examines how the combination of these two solutions can deliver powerful patient results greater than the sum of the two solutions used separately. This combination of telehealth and PERS can allow patients to successfully age in place by addressing two major obstacles to senior health – the management of chronic illness and emergency response to prevent readmissions and help seniors stay healthy and independent. Click the image below to view or download this white paper.